Instead of being stressed out by the holidays, have yourself a silly good time with an ugly Christmas sweater party. Whether it is a gift from grandma, a pickup from a thrift store, or buying yourself a brand new ugly sweater that is geeked out to light up and play Christmas carols you can have a lot of fun decking yourself out in what has become the hottest holiday fashion trend. My friends over at WHOLESALE PARTY SUPPLIES & WHOLESALE HALLOWEEN COSTUMES have shared with ageekdaddy.com some fun tips for having yourself a holly, jolly ugly sweater party as part your Christmas festivities. Spend your money on booze and food instead of fancy custom invitations. Download these FREE Ugly Sweater Party invitations. 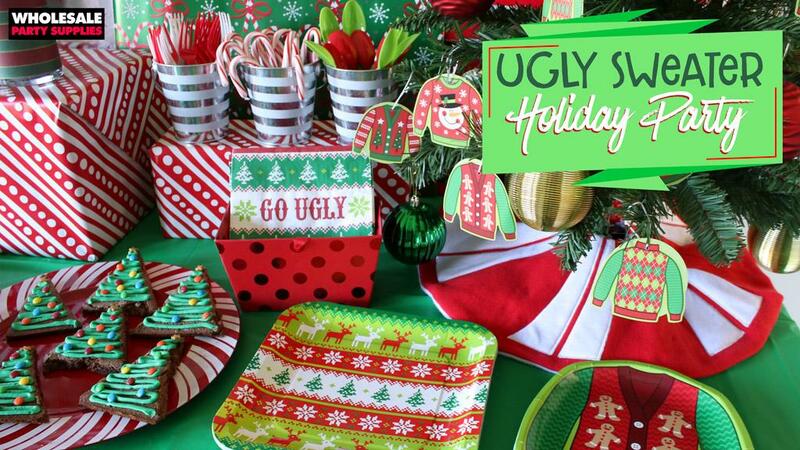 Save even more money on hosting your Ugly Christmas Sweater party by having it as a potluck. Use the FREE Perfect Potluck website as an easy way to track everything that’s being brought. Encourage guests to use this website by writing about it on the back of your party invites. 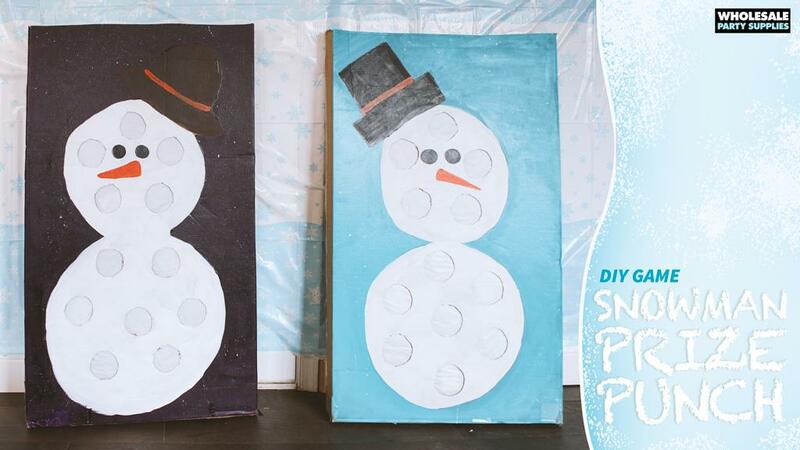 Craft a Christmas backdrop by wrapping recycled cardboard in cheap gift wrap to create faux presents. 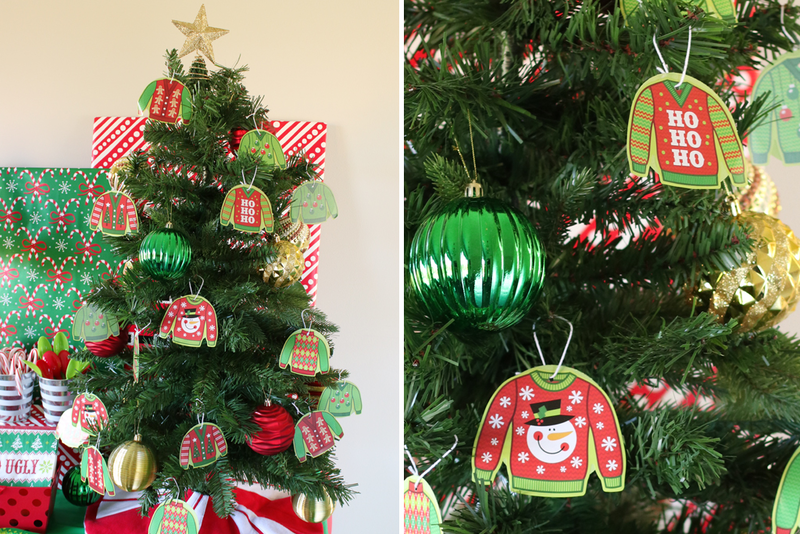 Compliment the presents with a mini-Christmas tree adjourned in ugly sweater ornaments. You can make these ornaments yourself with ugly Christmas sweater stickers from WHOLESALE PARTY SUPPLIES along with some cardstock backing and ribbon. I want a reinBEER to drink! 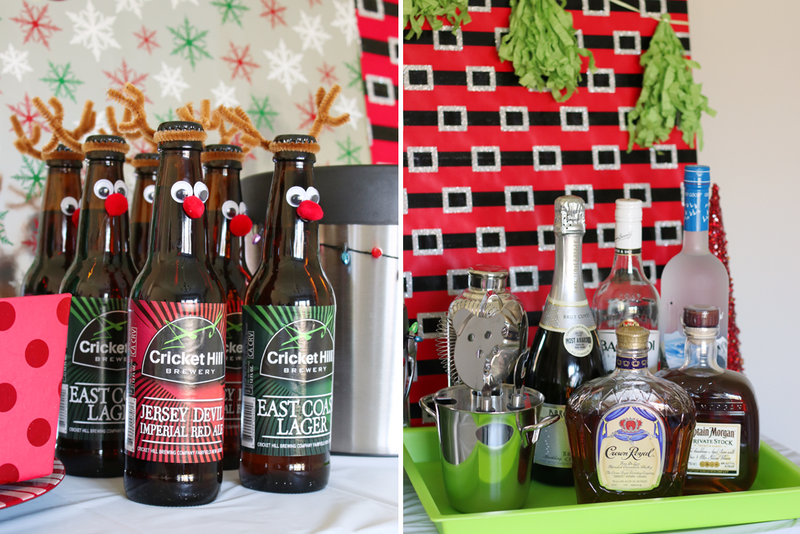 Alcoholic or not, decorate your favorite bottled beverage as a reindeer. Just add googly eyes, pom poms for a nose and pipe cleaners for antlers. 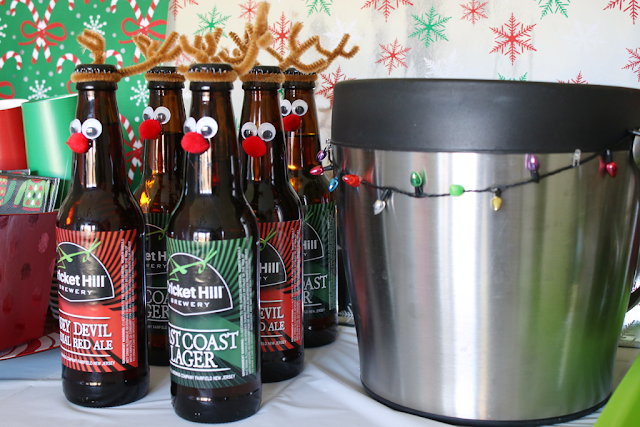 Make your reinbeer extra festive by serving beverages that have green or red labels on the bottle. Head over to the WHOLESALE PARTY SUPPLIES blog for tips on making some sweet treats for your Ugly Christmas Sweater Party. 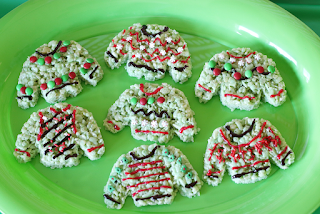 Pick yourself up an ugly sweater cookie cutter to make some themed Rice Krispies treats or sugar cookies. Make a sheet cake that looks like an ugly sweater. Making brownies that look like Christmas trees or mashing up Oreos to make cookie balls that look like ornaments are some other delicious ideas your guests are sure to eat up. 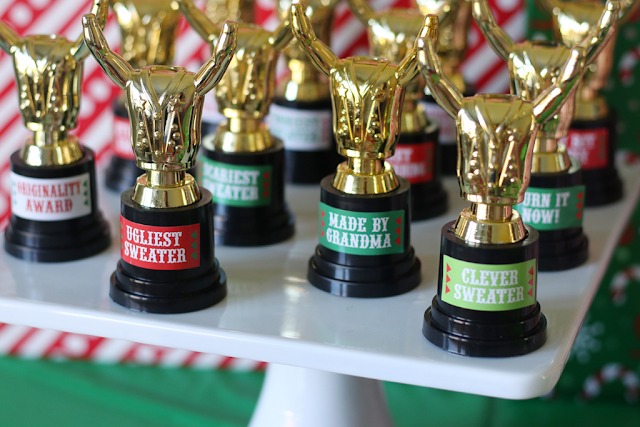 Give out awards for the best ugly sweaters with these mini-trophies from WHOLESALE PARTY SUPPLIES. Need an Ugly Christmas Sweater? Head over the website for WHOLESALE HALLOWEEN COSTUMES to get yourself one. They have Chanukah and Hanukkah ugly sweaters too. Make yourself a Snowman Punch game. Punch open a hole in the snowman to find a prize. Here are some diy instructions to create your own game. 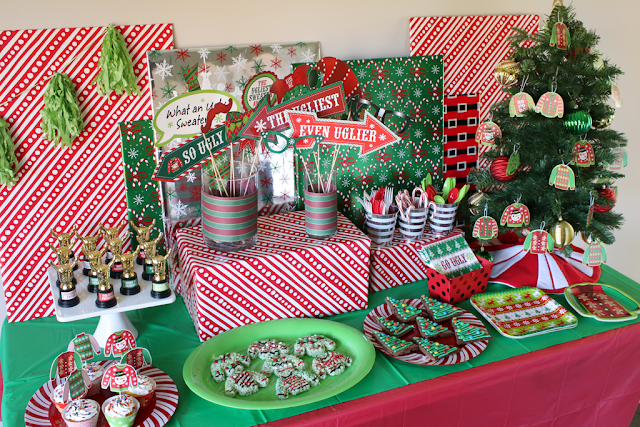 For more holiday baking, craft and decorating ideas head over to the WHOLESALE PARTY SUPPLIES blog. It has a number of holiday themed posts ranging from instructions to making luminaries to hosting an Emoji themed Christmas party. I read their blog all the time looking for creative ideas for family activities. Check it out!